This entry was posted in Farm Finance, Pasture Management. Bookmark the permalink. I see roadkill beavers near the Mississippi river from time to time. I don’t want to know what they do to a car. Those are big animals. Top hats are out of style. Can you exclude them? Why not buy the cows and let them pay for the pond? That’s a question worth considering. In part because cows are the most expensive they have ever been. In part because I don’t have sufficient infrastructure on the farm to survive a drought. Just imagine if a storm took out our power for two weeks in August. Additional water sources give me options for handling unexpected situations. I guess the last bit is because we have whittled our herd down to a core of functional animals. If I go out and buy more I’ll have to whittle away more. Sounds like you may need a ranking framework to help with prioritizing decisions. At my work we use Kepner-Tregoe style analysis to help rank decisions. 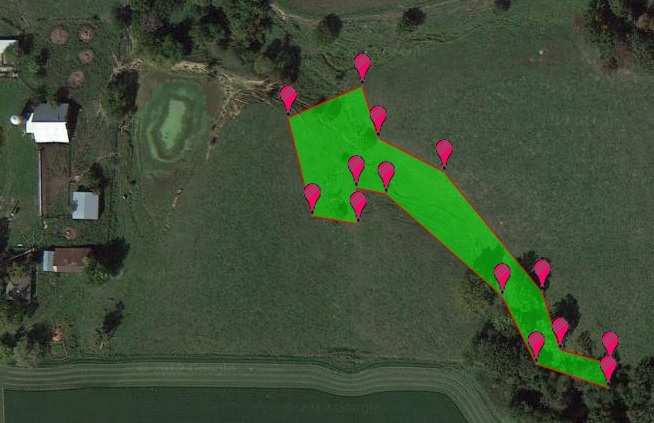 The simple version is list all the alternatives (tractor, ring, roof, pond, etc) and rate them all on multiple dimensions in order to get a final ranking. In my day job we use things like NPV, environmental impact, and risk as the dimensions we rate. I think NPV is always applicable, but other items to consider for farm specific uses might include enhancements to productivity, reduction of labor or time, impact on comfort, impact on fertility, or really anything that has value to you. The idea is then to rate each; the simplest way is to assign each a 0-10 rating, then sum the ratings for each (or you could apply weightings to each dimension: 10% to comfort, 50% to NPV or return, 20% to fertility, etc), and sort by relative value to get a prioritized listing. I’m afraid I’m strongly biased toward the pond. It fits the “Do something” criteria, it’s big and impressive, it’s “for the future”. Will it, on its own, cashflow? Probably not. But will it boost fertility by 30%? Will it help me grow 25% more grass? I don’t know what that even means man. The change in management to high-density rotational grazing has given us more grass (and many, many more amphibians) than previous years…or maybe it’s just the rainfall. Or both. How do I rate calves? More work. How do I rate a pond? More fishing. I’m really the wrong person to assign numeric representations to subjective values. I understand the theory. I also understand my own bias. It is difficult to overcome a bias, understanding it is the first step. The ranking method helps call them out, but no one says you can’t overrule the ranking. But at least you’d do it deliberately. I know, who doesn’t want (another) pond? My humble 3 acres came with a .2 acre pond, and I know exactly where I could fit a second .2 acre pond. But my only reason to do would be because I want to. Maybe that’s good enough? … Well, at least until I talk about it with my wonderful wife 🙂 I guess it’s time to get serious about raising ducks and fish. An old farmer once told me “Corn in the bin is money in the bank.” I think water is the same…maybe more so. Here in the west, water is like gold. And not just now with our drought. My water/pond bias may come from my father being in the water business. You need to store it when you can get it. Cattle seem high priced now, so you can wait on them. Are front end loaders high now? May build the pond and a loader will come along later when other money is available. You and Steve agree. And I do too. I’ve got the candle burning at both ends right now. We’ll see how this goes. Sounds like your decision is for the pond so moot point. So what do you get for 10k? Is that dug with a hoe? If so what do you think about Greg Judy’s advice to hire a bulldozer for 5k rather than the more expensive hoe? How many # gallons would the pond hold? Is it big enough to store a supply through a 2 yr drought so you are bullet proof and worth every penny for that peace of mind alone? If the power went out for 2 wks it is close enough to the yard you could pump water so that is a plus too. How deep is it? Do you have a high water table to fill the pond or would your still get enough surface run off from your selected higher location? So that leaves mosquito-breeding area (no the frogs didn’t put much of a dent in them), algae blooms depleting the oxygen in your water and killing your fish, cold winters freezing ponds solid (when pond not deep enough) and killing your fish, moderation of temperature – ? never experienced it. The Cdn Prairies are a dif climate than you though..
That’s an interesting article you linked to. January is significantly colder in Minnesota than here. Besides, I haven’t read much in land grant college papers that play out well in the real world. They still rip soils, spray poison and park cattle. The holstein thing is another Steve suggestion. He just raised a pair of steers to finish along with his jersery herd. Holy cow! those are big cows. And that’s the point. I kinda need a team of giant solar-powered bulldozers. Or I could just try to put a few pounds on them with my excess stockpile and cheap spring grass, gaining fertility and pasture condition along the way. I mean, heck, we’ll cut our last cutting of hay around Sep. 1. The alfalfa will continue growing till mid-October then it will freeze and leave stems full of weevil standing until spring. It would be better to graze that alfalfa off quickly as it begins to recover from that final cutting but I’ll have a really, really hard time covering 17 acres with 6 cows and 5 calves. And then I’ll have another 40 acres of stockpile to gobble up. If I could buy beef calves I would but I suspect I’ll have to pay an absolute premium for them in the current market. Dairy steers would still be high but not prohibitive…maybe. Gordon Hazard says to buy lower-quality cattle when markets are high, focus on quality when prices fall. But is that for me? Really? I don’t know. But as you say, when it comes down to it, I just want another pond. If I can afford it. Your friend Steve has real data having done so himself – any chance he would share details – start/finish weights, ADG, did he butcher them and can report on marbling etc? Interested in checking it out? I see you have a Ritchie Brothers Auction in Chicago – check it out at https://www.rbauction.com/ Sign up for an instant acct to get a password then sign in and search the Auction Results. I did Construction, Excavator <20k and see in their IL May auction two 9’ sticks sold – one for 10k the other for 15k. Or if you prefer, switch to Dozers and two sold btwn 10.5k-11.5k. Ritchie’s even provide shipping and will give you a quote online. My ex operated a high hoe one summer mostly digging dugouts and with lots of experience with farm machinery it was easy for him to pick up right away. Btwn you and your dad it could be doable if you wanted to have your own Pond Digging Palooza? Next IL Auction is July 30th. If your dad goes with you warn him this ain’t no farm auction at the concession stand – i.e. I'm pretty sure their pie comes from a cardboard box vs the local farm wives, so you might have to treat him when you get closer to home lol! I know what you mean about bringing other people and their livestock onto your land. When I first bought my farm I said no too, then once I got to know the various neighbors and their husbandry then chose one. Yeah I guess with your first pond you are creating a dam too so not quite as straightforward as digging a dugout that just catches runoff. So real Tonka Toys are not in the cards for the first one but maybe after you see how it is done and in the future have a simple dugout to build you might get your chance to drive one! 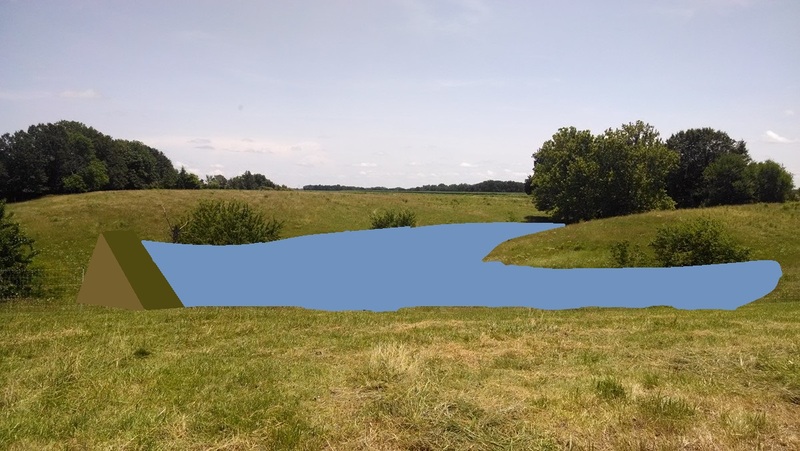 I look forward to hearing about the dvlpmt of this first pond/dam in your future blogs. A dozer, a trencher, a baler, a no-till drill, a loader … if you won the lottery we know what you would be buying! If I won the lottery? Really, my chances of winning are not diminished by not playing. Hmmm. What would I do with a sudden windfall of cash? Would I quit my job? Would I buy more land? Cattle? Iron? I think I would ask my four children to claim the prize together, then encourage them to lock that money away in a trust or something that can’t be touched by greed or vendetta. Would a million dollars buy a dozer? Sure. But only if it is part of the vision.